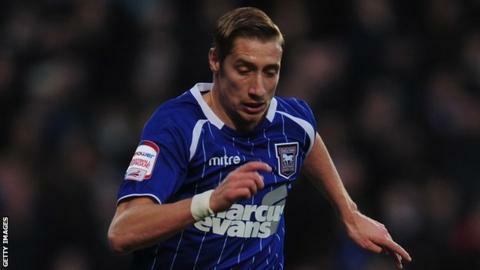 Ipswich midfielder Lee Martin has insisted he wants to sign a new deal at the club, but says talks have stalled. Boss Paul Jewell has stated his desire to keep the 25-year-old, who is out of contract at the end of the season. But Town have made a habit of losing out-of-contract players recently, with Gareth McAuley, David Norris and Grant Leadbitter all leaving for free. "Last we heard my agent got an email saying 'we'll be in touch'. That was in August," Martin told BBC Radio Suffolk. "We haven't heard anything yet so the ball's firmly in their court regarding that. "That's life. That's the life of a footballer. You've just got to get on with it. Sometimes you want to get your future sorted but you've got to get on with it." Ipswich owner Marcus Evans has been attempting to cut the wage bill at Portman Road over the past 12 months. And when asked if he would be willing to accept a drop in pay, Martin said: "That's what negotiations are for - but they never really got going." Martin has received criticism from Jewell for his disciplinary record in the past. And the former Manchester United player believes that being booked in his last two matches, he has overcome the immaturity that saw him sent off in both the previous seasons. "I'm on my best behaviour now. I'm a new man," he joked. "It's part of growing and I feel I've done that."